The soil was moderately fertile and well drained but had been compacted by my constant footsteps during stair construction. I loosened the ground by, every few inches over the thankfully small area (8 by 8 feet, approximately), sliding the tines of a garden fork straight down into the dirt and wiggling the handle. Then I raked the surface smooth, sprinkled on some grass seed, and raked again. That was the easy part. The next job was to keep the ground moist and to keep birds, especially my chickens, at bay. 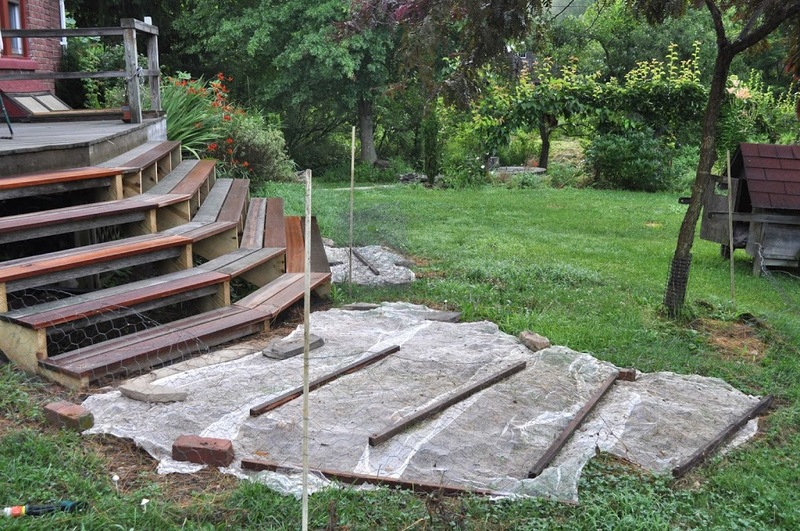 For moisture retention, I covered the prepared, planted ground with a thin layer of hay. For even more moisture retention and to keep birds at bay, I covered the hay with a single layer of cheesecloth, weighted down at edges and corners. The grass will grow up through the cheesecloth which, being cotton, can be left in place to rot away. For even more bird protection, I enclosed the area with a temporary, chicken-wire fence. Daily watering has already brought on patches of bright green, thin sprouts. Once seedlings are growing in earnest, I’ll taper off on watering to every few days. The delicate, young grass sprouts evoke such fond memories, not of large lawns but of a toy I had as a child. It was a miniature farm, a couple of square feet, with a little barn, silo, coral, and house. The farmette came with soil, which, as directed, I spread on the field, and grass seed, which I planted and watered. I was awed and delighted by the small sprouts greening the brown field. I don’t remember ever mowing (with a scissors?) that field, but once my new grass gets firm footing, I will be mowing it — not one of my favorite activities, although I do like the result. In contrast to my horticultural skill with lawn, I am very good at growing blueberries. And this is an especially good year for me and other blueberry growers. Our 16 plants have yielded, as of July 22nd, about 80 quarts. Bushes are still going strong and others have yet to begin ripening their berries. least, with 12 inches rather than the usual 4 inches — could be a factor, but every year my blueberries’ thirst is quenched automatically with drip irrigation. (Note to myself: Consider irrigating more in the future.) Heat in July? Who knows? Blueberry plants do have an odd growth habit this year, with branches arching down low to the ground. A heavier than usual crop could be the cause. Or, perhaps, overly succulent new shoots because of abundant rain and limited sunlight in June, and excessive heat in July. Except that many of those recumbent branches are of older wood, from previous seasons. So many questions; so few definitive answers. A recent bike ride in the Shawangunk Mountains, where blueberries and their relatives are abundant, revealed a relatively sparse crop there. With all the berries at home, it was no great loss for me. I did slam on my brakes for some ripe huckleberries, though. Many people use the words “blueberry” and “huckleberry” interchangeably. In fact, they are different, but closely related, fruits. Put simply, blueberries are species of Vaccinium, and huckleberries are species of Gaylussacia. Put even more simply, if, when you eat the berry, you feel the small seeds crackling between your teeth, you’ve got a huckleberry in your mouth. I didn’t screech to a stop just to eat huckleberries. I also wanted seeds to plant and increase my current huckleberry “plantation” of two plants. The berries not only taste good, very similar to blueberries, but also are very pretty, especially in autumn with their fiery, red leaves. Back home, I mashed the berries in a glass of water, then let the mix sit for a day. The small seeds settled to the bottom of the glass. Stirring, then pouring off whatever floated most easily, cleaned the seed. What’s needed next is patience. Reports indicate that huckleberry seeds germinate poorly and that germination is slow. And that’s after giving them a warm, moist stratification for about a month, to soften the tough seed coat, followed by a couple of months of cool, moist stratification, to let the plants know that “winter” is over. This is what you might expect for a seed from a berry ripening in cold climates in midsummer; if the seed germinated immediately, the small seedling — and huckleberry seedlings grow very slowly — would succumb to winter cold. My plan is to sprinkle the tiny seeds on some potting soil in a pot, water, cover, with a pane of glass, and leave the covered pot outdoors in partial shade. When and if seedlings appear, I’ll uncover the pot. I like huckleberries. Perhaps I’ll get them to grow. This entry was posted in Uncategorized and tagged blueberry, huckleberry, lawngrass, Shawangunk Mountains. Bookmark the permalink. Trackbacks are closed, but you can post a comment. Wow look at those berries! 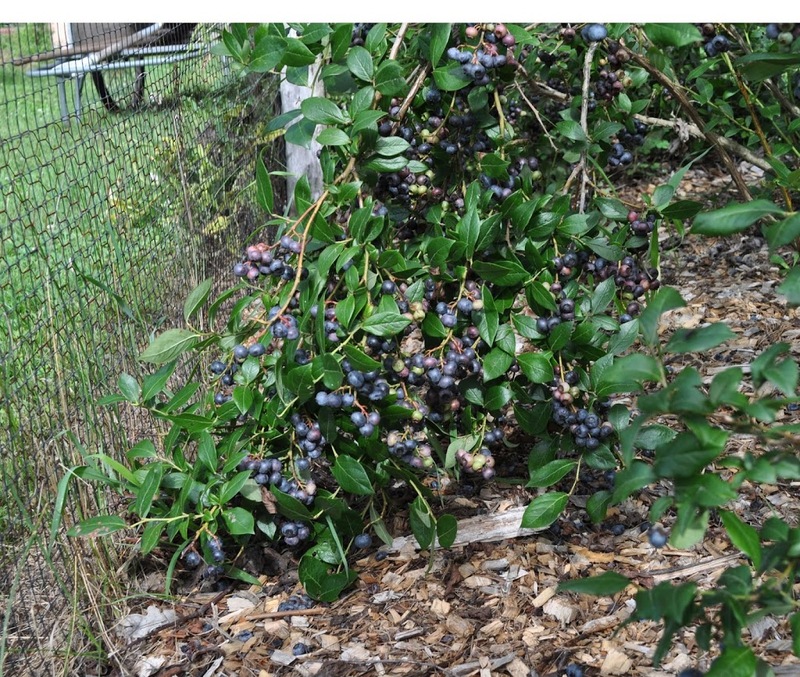 Question: Is there a concern about the weight of the blueberries ripening breaking the plants? Do blueberries require thinning like stone fruit? Blueberry stems are pretty flexible so stems should not break. Of greater concern is berries on the ground. No need to hand-thin blueberries. Winter pruning does this to some degree. Varieties whose stems make lots of fruit buds (the fatter buds in late winter) do best if the ends of those stems are shortened a bit to reduce the number of those buds. What pH does a huckleberry enjoy? With a limestone ridge running through my yard I have a pH > 7.0 so I can’t do blueberries. Huckleberries like pretty much the same pH as do blueberries, 4-5.5. What I’d suggest is digging out a hole 3 feet across and 2 feet deep and filling it with a mix of peat moss and soil. That soil should be sufficiently acidic and can be kept so with periodic additions of elemental sulfur. 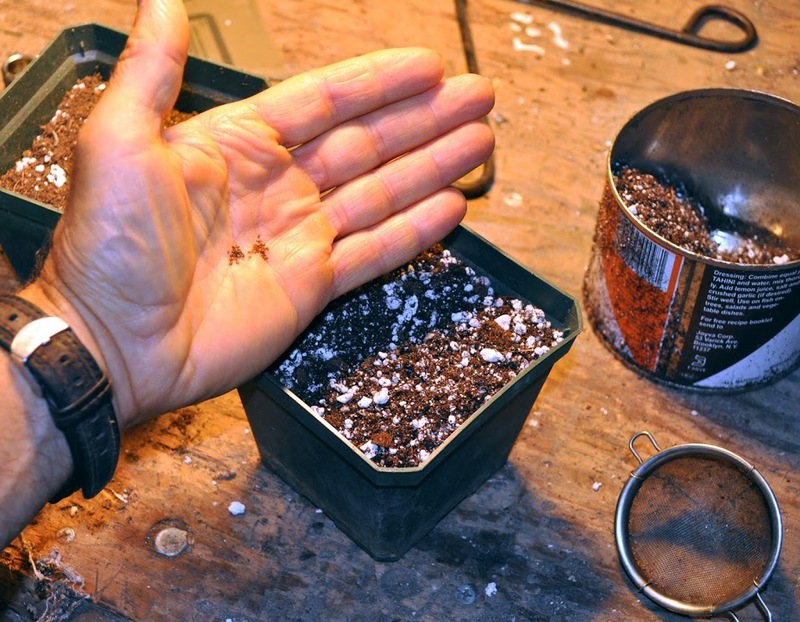 Sow the seed in potting soil in a pot or seed tray, water, and leave outdoors. They may sprout this season or may wait until next spring. They’re very delicate and slow-growing when young.